Most of the trees in the Amazon can be felled with no C02 consequences! 0835Dr Michelle Johnson, Earth Systems Scientist from the University of Leeds, has co-authored a report showing that about 1% of all the tree species in the Amazon account for half of the carbon locked in the vast South American rainforest. Although the region is home to an estimated 16,000 tree species, researchers found that just 182 species dominated the carbon storage process, meaning the rainforest’s ability to store carbon could be more vulnerable than previously thought. We are experimenting - and learning fast. But that learning needs feedback, so don't hesitate to contact us by email paul@radiofreeuk.org or on twitter @rfreeuk. The eventual plan is to provide a full days listening, like having the radio on in the background all day. Broadly with a morning, working day, evening feel. As a series of podcasts, you can speed up, skip, and jump around - so don't get bored! If you don't like something or have heard it before etc - just skip it! If you do like it great! If you really like it, visit the original website (links from the show or from our website http://www.radiofreeukorg) and get more, subscribe directly, support the producer! If the TTS is a bit slow - play at 1.5x speed (depending on your podplaying device)! Live content - we have plans for 'just in time' content, so if you are online the schedule can be updated in real time - the schedule evolving during the day (quite a technical challenge!) - and to have a live audio feed directly from the site. RadioFreeUK.org - Its all about the Pods - Podio will kill the Radio Star - once it has the content - let 10,000 new pods bloom. Its chicken and egg - without an audience people won't produce material/content/pods. But without content there will never be an audience! Well, now the egg is cracking. We are launching RadioFreeUK.org because we believe there is just about enough content now to start assembling an audience (thats you) and as you gather, other people (maybe even you) will see that producing material (new podcasts) is now worthwhile. Firstly UK podcasts, this is the material we really want - talent making their own shows, that we can help spread to a wider audience - this is what we want to encourage, but as there hasn't been such a market for this material (until now) it is still a bit thin on the ground. Secondly US podcasts - the material is great, but obviously not always as relevant to the UK - but will, hopefully, show our listeners the way and inspire them to produce their own UK versions of these shows. Thirdly text to speech blogs, while there isn't so much podcasting in the UK there are blogs and websites - so we have setup a system where blogs and webpages can be read using the latest 'text to speech' technology. This isn't perfect, but please bear with it, and if you like the content (if not the voice) - email the blog owner and ask them to read their own blog, record it and add it to their postings - so making their blog a podcast, simple! Fourthly I do some stuff - like this! Finally - any other relevant audio content we can get that we think you might like. RadioFreeUK.org - now is the time. The state loves monopolies - and it doesn't mind overly who owns them, as long as the state gets its pound of flesh in the form of tax. Private monopolies tend to be easy to tax, the state can just send the tax bill to the companies HQ and it gets paid - the company passes the tax cost on to the consumer who has no real choice but to pay, because its a monopoly. In this way private monopolies are simply private tax collectors, taking money from us the consumer and passing it on to the state, all under the guise of providing its product/service. Most public monopolies are actually much the same - the state will make out that they are run 'at arms length', filling the boardrooms with the usual shower of (so called) great and good on huge salaries and pensions, that is their kick back. And then tax the quango just the same, with the cost of those taxes being passed on to us, the poor consumer of this monopolised product or service. This is how the BBC came about - it was the states monopoly on the airwaves. There is only so much radio spectrum, so the state allocated it all to itself and jealously guarded it - some older people will remember all the fuss there was over getting 'citizens band radio'established in the UK! Oh how jealously the state guarded its monopoly. It took years to get a tiny piece of the airwaves set aside for we plebs to use, and even then the state demanded licencing so it could get an extra pound of flesh from us. But now things have changed - primarily thanks to our American cousins - we have the internet. The UK did have its own version long ago, but like all British state monopolies it was jealously guarded and controlled so grew twisted and stunted until it was swept aside and replace by the free market of technology that was the internet. Thousands of individual brains working on different parts of the solution with a framework so anything good/useful could be adopted and included - not the few state backed 'experts' deciding what is best for everyone else which is how the UK government prefers to work. So now we have the internet - still substantially a free for all, but with huge sharks circling waiting for an opportunity to seize control, make it a monopoly and tax us for it until our pips squeak. And those sharks are getting close - even the BBC is now bidding for the TV Licence - or 'television tax' - to be extended to be include a tax on us using the internet too. The BBC (under the direction of those 'great and good') has abused its position for years primarily to preserve its own existence, but also to push the 'great and good's own agenda - a left wing agenda designed to keep the plebs all equal at the bottom of the heap in one anonymous mass, with the privileged, great and good elite lording it over us. We as 'comfortable' but limited pets/slaves/servants, they as free and unrestricted owners, masters and rulers. Of course the BBC's 'great and good' know that their useless comfortable life styles are under threat and are fighting tooth and nail to keep their unearned, undeserved, unnecessary privilege. But if we work together we an make them an irrelevance and they will simply whither and die. We simply don't need the BBC any more. There is no monopoly to be protected, unless they manage to steal our free access to the internet and monopolize it, they certainly used to have a special tax for the modems we used to access it in the early days. Anyone can make programmes, anyone can put programmes on the internet, anyone can provide links to those programmes, anyone can use those links to see he programmes. It just needs a critical mass to establish itself and the BBC becomes an irrelevance. So here I am providing a platform for the public to find and access content - nothing is really ground breaking technology wise - but by providing a focus for the type of content the 'great and good' hate (that is liberty loving, small state, low tax, anti-EU kind of content), I hope to gather an audience that will allow a thousand new liberty loving podcasts to bloom. Support me, support the pod makers, become a pod maker!, bring freedom of speech, thought and expression back to the UK, and never let it die. For a better life cut out junk foods, just keep the good ones. And cut out the junk migrants, just keep the good ones. I am pretty fed up with the British pro-EU establishment banging on about 'migration this, migration that' as if migrants are one indivisible blob of being. They talk as if the only choice is between migration with open borders or no migration at all - either you have unlimited migration or none. As if saying anything against any migrant can only mean that you want to end all migration and seal the UK's borders. There may be some in the country who want UK's borders sealed - but if so, I have never met or even heard of them. In truth British pro-EU establishment have to do this, play this silly game of 'lets pretend we do not understand that there can be a situation other than completely open border or closed borders' because the real alternative of controlled borders with managed migration is not possible while the UK is in the EU. Because the EU control UK migration, and demand we have open borders, the British pro-EU establishment employ childish scare tactics pretending there is no other rational position so that it is nothing to do with the EU, just logic. This is no different to a bottom of the range, nutrition-free, fat-loaded, additive packed, genetically modified, obesity in a bar, junk food supplier saying that 'food is essential to life, so you can't ban it'. Of course no one is going to think of banning all food just because someone is producing a harmful junk-food product. In the same way no one (I know of) is suggesting banning migration (although some weird new-age Australian sect do claim to live with out food, on sunlight alone! so there may be some odd-balls who do), most if not all 'opponents of migration' simply oppose the current lack of control and management, just as people oppose obesity inducing junk-food. Good, healthy, tasty, nutritious meals in sensible quantities are good for a body - Good healthy, decent, skilled migrants in sensible quantities are good for a country. Bad, unhealthy, un-nutritious, fat laden meals eaten in large quantities are bad for a body and its health - Bad, unhealthy, unskilled, migrants in large quantities are bad for a country and its economy. So control you intake - keep the good, reject the bad. For a better life cut out junk foods, and the junk migrants. Just keep the good foods... and good migrants. And never forget who these British pro-EU establisment people, who feigned incomprehension just to steamroller you into having their perverse, unhealthy beliefs imposed upon you. They include all the politicians of the Conservative Party, Labour Party, Liberal Democrat Party, the BBC, Common Purpose, the EU and many other groups who consider themselves the elite to control our lives. Remember, and tell your children, never to trust them again. Take it Back. there is going to be a revolution. Not sure I need to add any thing on this blog post - the image says it all. 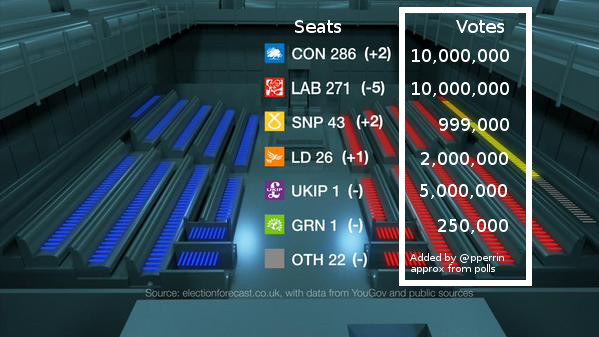 The figures are approximate from polls etc - but the underlying message is 100% clear - our democracy is broken. The UKIP vote will be about the size of the entire Scottish electorate! But that will still probably lead to UKIP getting one or two MP's while on one fifth of that vote SNP are expected to get over 40 MPs. As long as voting is based on geographic regions having support focused in specific areas rather than spread will give an unfair advantage in getting representation. This will be true even with an alternative method of counting votes (like AV - which was rejected in a nation wide UK referendum a few years back). Changing the way MPs are selected (moving away from or adding to the geographic element) has some merit - there used to be non-geographic constituencies so it is not a totally new idea. However PR (proportional representation) is not a solution. PR means you are voting for a party - not a person - if your candidate is not elected your vote goes towards supporting the party - which basically means supporting the party leader. How would you feel if you voted for a decent local candidate who didn't get in then their party leader used your 'mandate' for some nonsense your candidate would have opposed tooth and claw? I believe 'liquid democracy' is the way forwards (in one of its various forms) - you don't 'elect' a representative, you simply have the right to nominate a proxy for your vote in parliamentary divisions. Each 'MP' votes with the weight of the proxy's they have been given - you could give different people your proxy for different issues - so Farage on EU matters, someone else for devotion matters etc - and at the end of the day, if you really want, you can vote yourself, directly if you so wish. But right now, if this result comes to pass and one million (rabidly pro EU and anti English) Scots get to decide the government of the UK, while many times that number of UKIP supporters get almost no representation at all there is going to be a revolution.